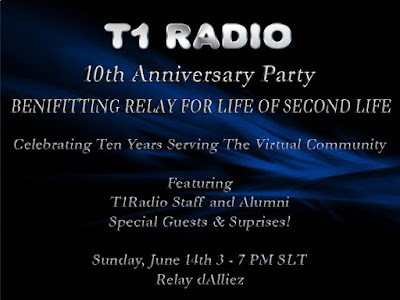 Arinultra Cay, Second Life T1Radio announced their plans for party on June 14, 2015 to celebrate their 10th anniversary. The party will take place from 3 to 7pm at Relay dAlliez and will feature T1Radio's current air-staff, alumni and special surprise guests. T1, the long time Official Broadcaster of Relay For Life of Second Life, is the sponsor of the Relay Rockers team, and the party will be held as a benefit for Relay. In January 2005, Trader Whiplash, who began the station along with Nuala Maracas, was a host for the late Alliez Mysterio's La Vie En Rose. When Alliez and Tony Beckett decided to begin broadcasting to the club as Radio dAlliez, Trader was given the opportunity to learn to DJ. He crafted his sets around classic rock and roll, a change from the pop and electronic music popular in SL clubs at that time. The station broadcasted to La Vie en Rose and the Rue dAlliez sim, one of the first private 'islands' created in world. By June of 2005 Alliez and Tony had turned their attention to the establishment of dAlliez Estates and were about to close the station and the club when Trader reached an agreement to maintain both. He changed the name to T1Radio and along with his best friend Nuala Maracas, began to build a staff. Early members of T1Radio included Anthony Wesburn, Java Mama, Sassyblonde Hebert and Rex Tardis, and Radio Riel's Gabby Riel. Diana 'Dee' Wolfe and Madelyn Majestic also joined the station and continue to broadcast weekly shows. The station remained in Rue dAlliez where it operated its home base club LEGENDS Classic Rock until 2011 when it moved to its own sim. T1Radio and Relay For Life have become almost synonymous. 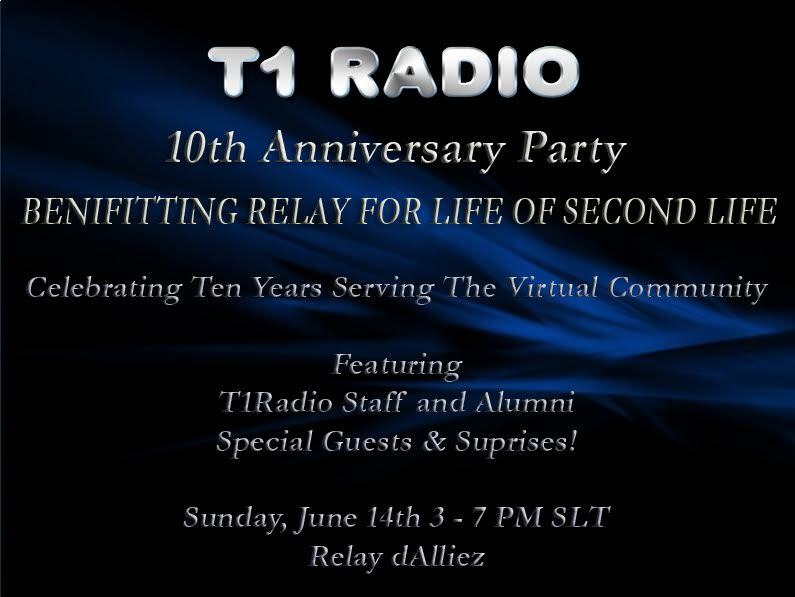 When Jade Lily organized the first Relay For Life in Second Life T1Radio was there to support the fundraising. Trader, a leukemia survivor, Nuala and Alliez began a team based at La Vie en Rose. The team became known as the Relay Rockers and has participated in every Relay held in world. In 2006 T1Radio was asked to fill in when the scheduled audio was unable to continue following a grid crash and Trader and T1 stepped in and rocked the track well into the night. The following year Fayandria Foley asked T1 to return and thus began a 10 year relationship between the biggest event and the oldest station in Second Life. In 2014 the American Cancer Society and Relay For Life recognized Trader, Nuala and T1Radio for its dedication and contributions to what has become one of the largest Relay For Life fundraisers in the world by inducting them in the RFL of SL Hall of Honor. Today T1Radio remains a fun station with friendly DJs, great mixes of music and 24/7 Classic Rock the Way YOU Like It. Hosts and DJs can apply to T1 by contacting Trader, Nuala or LEGENDS Manager Xyza Armistice. T1Radio, Trader and Nuala remain dedicated to providing entertaining music for everyone. They remain dedicated to supporting Relay For Life as well as the Dreams community and the AviChoice Awards.